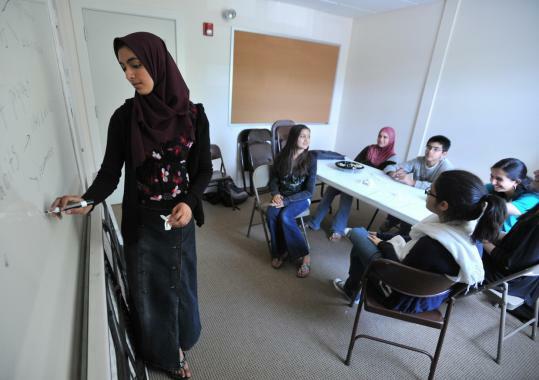 Hajara Shareef teaches a class of teenagers at the Islamic Center of Boston in Wayland. WAYLAND — Months ago, the Islamic Center of Boston began planning an open house and lecture, “Everything you wanted to know about Islam but were afraid to ask,’’ to celebrate its 30th anniversary. Then came an attempted car bombing May 1 in New York City’s Times Square, allegedly by a man with links to the Taliban in Pakistan. Members of the center, at 126 Boston Post Road (Route 20) in Wayland, say the unfortunate timing gives them an opportunity during the long-awaited open house to remind the larger community what peace-loving American Muslims stand for. The event, being held Saturday from 11 a.m. to 4 p.m., will include tours of the center, hourly presentations about Islam, and refreshments. It’s been three decades since a dozen Muslim families from the Cambridge area broke with a mosque in Quincy and started a religious school and cultural center using rented space in a public school. The group moved to Wayland in 1986, and today counts about 350 families from across Massachusetts, New Hampshire, and Rhode Island. In the late 1970s and early 1980s, most Muslim immigrants to the Boston area were from Lebanon and other Arab countries. Today, the Wayland center’s members reflect more recent immigration patterns, with about 60 percent hailing from Southeast Asian nations such as Pakistan and India, members said. There apparently is no official census on the state’s Muslim population, but various national religious-interest groups put the figure at approximately 70,000. The Islamic Center of Boston holds Friday prayer services for anyone who wishes to attend, but its real sources of pride are its interfaith programs, including the region’s first ongoing series of events and lectures focused on intra-Muslim issues, and its Sunday morning religious school, where 270 children ages 3 to 18 take weekly classes. Dr. Abdul Cader Asmal, a board member and past president, said the “Everything you wanted to know. . .’’ theme on Saturday is meant to make guests feel comfortable bringing up any topic, especially in the highly charged political and religious atmosphere stirred up again by the bombing attempt in Manhattan. US authorities say the plot was organized by Faisal Shahzad, a naturalized US citizen originally from Pakistan, reportedly with support from an overseas jihadist group. Despite its peaceful history, the center must continue to reach out, Asmal said. To that end, it hosts visits from area school and church groups almost weekly, is an active member of the Wayland-Weston Clergy Association, and maintains warm relations with a nearby synagogue, Temple Shir Tikva. Boston Muslims waged a bitter, yearslong battle to open a mosque and cultural center in Roxbury last year, but Muslims from the western suburbs said they have had no such conflicts with their neighbors, even during the center’s extensive renovation and expansion project in 2005. The terrorist attacks of Sept. 11, 2001, really tested the mosque’s community, however, with many members reporting feeling insulted, and even threatened, by acquaintances and strangers who blamed all Muslims for the tragedy. The mosque itself became a refuge for the larger community during that troubled time. The day after the attacks, shaken members gathered for prayers with some trepidation, recalled the center’s president, Malik Khan, a Boxborough electrical engineer. They found a collection of local residents waiting with flowers and consoling words. But the years following 9/11 have been difficult, said Khan’s wife, Tina, another longtime member who works as a manager at the Lord & Taylor department store in Burlington. Her work brings her into constant contact with the public, and the weeks and months following the terrorist attacks on New York and Washington, D.C., were very tense and sad for local Muslims, she said. Societal perceptions of Muslims have become more balanced since then, but it is a delicate balance, said Asmal. On a recent Friday afternoon, more than 250 men and women gathered at the Wayland center for the traditional weekly community prayer session — which, as in all mosques worldwide, is read in Arabic — and listened to a sermon delivered by one of the center’s founding members, Dr. M. Ghiath Reda, a Weston physician. At the Islamic Center, men and women pray in the same open room. Shoes are left outside in gender-segregated areas, and women, heads and arms covered, line the back of the room, while men pray together at the front. Non-Muslims are welcome to attend. Reda delivered a homily about the biblical figure Joseph who was sold into slavery by his jealous brothers and became an adviser to the pharaoh of Egypt. As an immigrant, Joseph used his skills and wisdom to benefit his adopted homeland, a good example for Muslims who come from other lands, he told the assembled group. Erica Noonan can be reached by e-mail at enoonan@globe.com. 1979 Nine families found the Islamic Center of Boston, using rented space in Cambridge to hold meetings and classes. 1988 The ICB opens its new headquarters in a 12-room house on Boston Post Road in Wayland. 2005 The center expands and renovates to house more classrooms and meeting spaces. 2010 ICB celebrates its 30th anniversary, with more than 350 member families and an estimated 270 students enrolled in religious education.